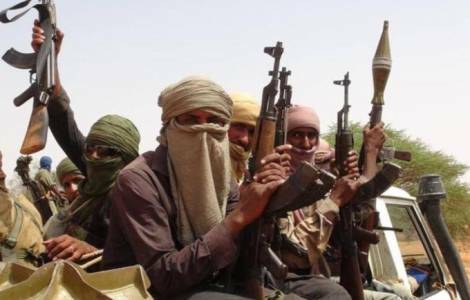 AFRICA/MALI - Christian churches targeted by jihadists: "A new and disturbing development"
Bamako (Agenzia Fides) - "The jihadists have started to target Christian communities and it is a worrying development", says to Fides Fr. Edmond Dembelé, Secretary General of the Bishops' Conference of Mali, who reports that "in the diocese of Mopti, in the center-north of the Country, there are at least three churches that have received the visit of jihadists who prevented the faithful from gathering to pray, sound bells, and have destroyed some furniture and sacred objects". In particular, says Don Dembélé, "last week some armed forces forced the door of the church in the village of Dobara, took crucifixes, pictures and statues of the Virgin Mary and burned them in the churchyard. Earlier in the village of Bodwal, Christians were expelled from the place of worship by armed men who threatened them, saying they would kill them if they had prayed again in church". "The area of Mopti so far had not been affected by the actions of jihadist groups that have long been present there. What worries us is that these groups had not targeted Christians up till now. The situation has changed in the last few months and for this reason we have launched the alarm". "This is a border area with Burkina Faso that has been attacked for some time by jihadists", adds the Secretary General of the Bishops' Conference of Mali. The presence of jihadist groups is extending in southern Mali, so far spared by the violence, as demonstrated by the abduction of Sister Gloria Cecilia Narváez Argoti, of the Congregation of the Franciscan Sisters of Mary Immaculate, abducted in Karangasso (see Fides 02/08/2017). "Karangasso is part of an area that was not particularly interested in the action of jihadists", says Don Dembélé, "although two years ago, the army in Mali had dismantled a jihadist group that had settled in the area, in a forest in near the border between Mali and the Ivory Coast". On the fate of Sister Cecilia, Don Dembélé says "unfortunately we have no news and we have no contact with her kidnappers".